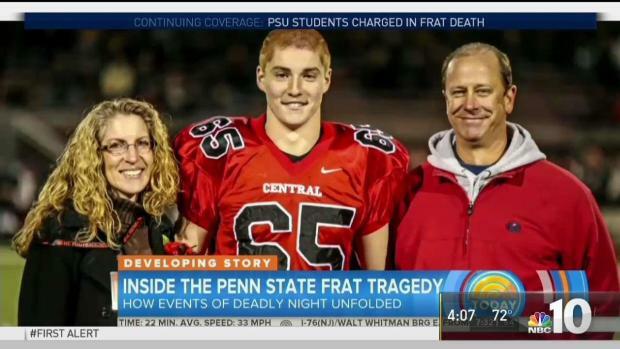 A Penn State University fraternity member who plied a pledge with vodka the night he was fatally injured in a series of falls avoided jail time on Tuesday when a judge sentenced him to three months of house arrest. 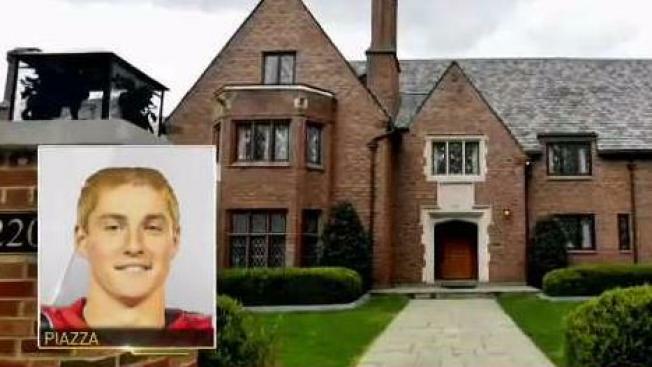 Ryan Burke, the first frat brother sentenced in the case, apologized to the parents of Tim Piazza, who died in February 2017 after a night of drinking and hazing in the Beta Theta Pi house. Burke said he was "truly sorry" and accepted responsibility for his role in the events that led to Piazza's death from severe head and abdominal injuries he suffered the night he accepted a pledge bid. Judge Brian Marshall also gave Burke 27 months of probation, fined him more than $3,000 and ordered him to perform 100 hours of community service. "The court was shocked by what happened that night," Marshall said, adding he was "mindful that there were many involved." Burke, 21, of Scranton, had pleaded guilty to four counts of hazing and five alcohol violations. More than two dozen other members of the now-closed Beta Theta Pi fraternity still face charges. A hearing for some is planned for next month, and a trial for others is set for February. The attorney for the Piazza family, Thomas Kline, called the first sentence "an important step on the long road to justice" for the Piazzas, noting it included the "loss of freedom of a admitted perpetrator of the crime." Burke's attorney, Philip Masorti, said he thought the judge's decision was fair. "This was an accident that nobody wanted to happen," he told the judge. "It led to a tragic death." Prosecutor Brian Zarallo with the attorney general's office said Burke played a key role in what occurred, heading up the fraternity's effort to recruit members and physically leading them into a drinking station gantlet that began a night of heavy drinking captured on the building's elaborate video security system. Piazza "didn't know what was waiting for him," that night, Zarallo said. "The defendant did. The defendant knew exactly what was waiting for him." He played a videotape in which a ball cap-wearing Burke could be identified plying pledges with a bottle of 80-proof vodka, and said Burke seemed nonchalant about Piazza's medical condition after he endured a bad fall down the basement steps. Burke "can't be bothered" and left Piazza for others to deal with him, Zarallo said, describing his actions as callous. "This is a big joke to these people," Zarallo said, telling the judge that five pledges vomited that night and one other injured an ankle. Piazza's parents, who have become anti-hazing advocates, recounted the horror of being summoned to the hospital to find their son with a range of visible and very severe injuries, not far from the death that would soon follow. "All he was trying to do was join an organization and make new friends," said his father, Jim Piazza, of Lebanon, New Jersey. Jim Piazza credited Burke for pleading guilty, but noted that occurred after a judge ruled there was sufficient evidence to send the case to county court for trial. "This group of fraternity brothers was playing Russian roulette with the pledges," he told Marshall. "Tim just happened to catch a bullet." Masorti disputed that his client acted callously and said Tim Piazza made free choices — to attend the event, to go through the gantlet and to drink. He focused on events that occurred after Burke had left, when members found Piazza unconscious beneath a makeshift basement bar the next morning and waited 40 minutes to summon help. "Tim Piazza got drunk, that's a fact. He fell down the steps, that's a fact. He was not properly cared for, and he died from his injuries from a fall," Masorti said. When Burke was first charged in November, he also was accused of involuntary manslaughter, aggravated assault, simple assault and reckless endangerment, but the attorney general's office dropped the most serious charges in April and a district judge subsequently dismissed some other counts.